Prevent shifting cargo from crashing through your vehicle's rear window with this sturdy steel rack. The louvered screen won't obstruct your view. 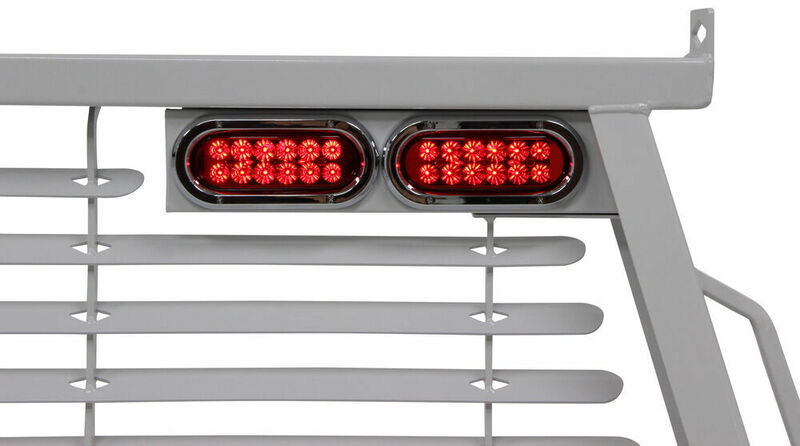 LED lights with chrome trim hardwire into your truck to give you brake, turn, and tail lights. 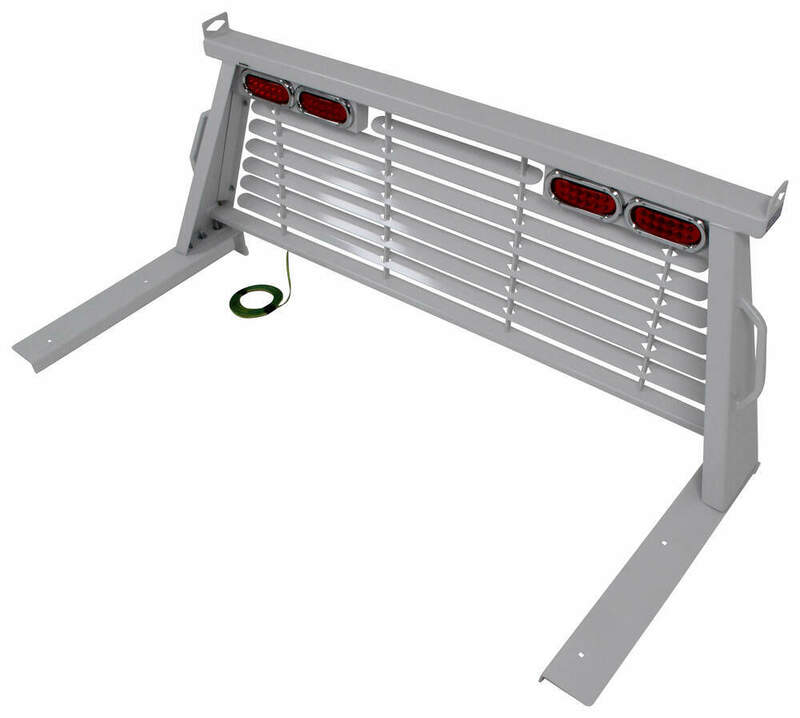 Call 800-298-8924 to order B and W headache rack part number BWPUCP7500WA or order online at etrailer.com. Free expert support on all B and W products. 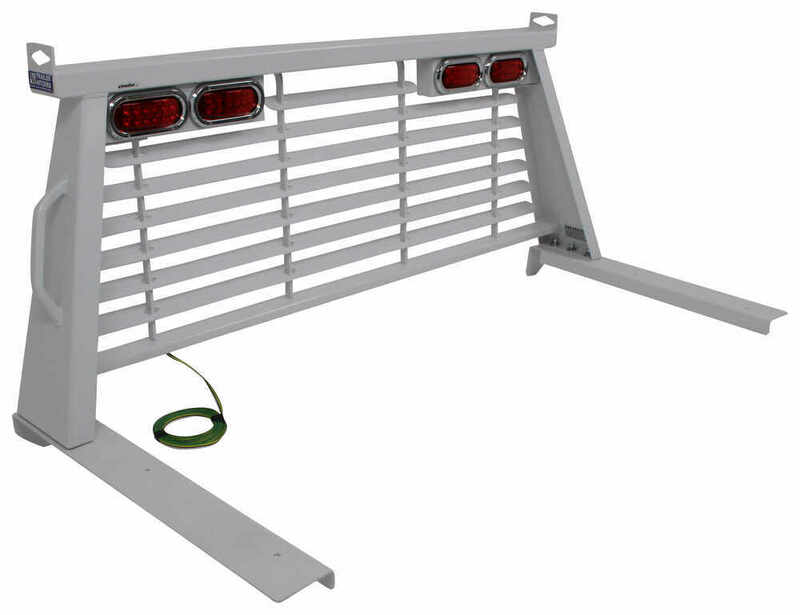 Guaranteed Lowest Price and Fastest Shipping for B&W Custom Headache Rack w/ LED Brake, Turn, Tail Lights - White Powder Coated Steel. Headache Rack reviews from real customers. Prevent shifting cargo from crashing through your vehicle's rear window with this sturdy steel rack. The louvered screen won't obstruct your view. 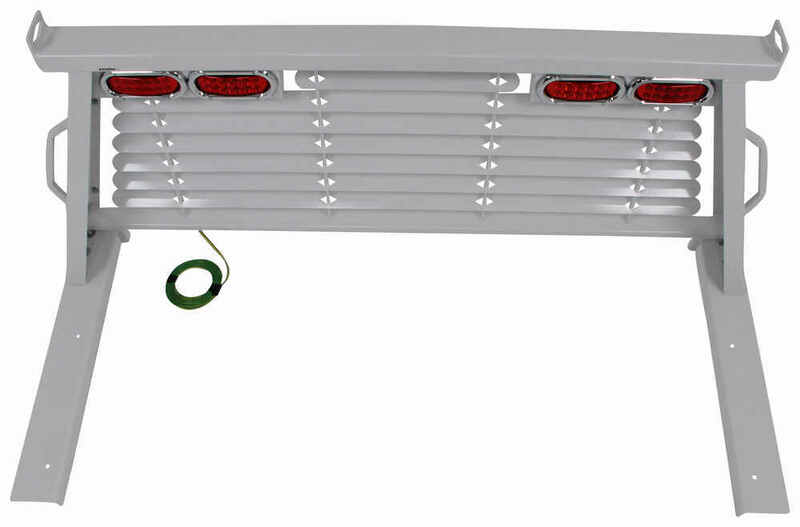 LED lights with chrome trim hardwire into your truck to give you brake, turn, and tail lights. LED lights are built into this headache rack. There are 4 lights. The 2 innermost lights tie into your vehicle's tail lights and the 2 outermost lights illuminate in tandem with your turn signals and brake lights. The entire lighting setup comes pre-wired so that you only have to connect a single harness to your truck's wiring to power all 4 of the lights. This headache rack is also built with oversize tie-down points on both sides of the rack that double as handles. Not only can you lash down your equipment by running even wide strap through the anchor point, but you can also easily pull yourself up to access your truck bed. Do you have a question about this Headache Rack? I called my contact at B&W and asked about your 2013 Ford truck. 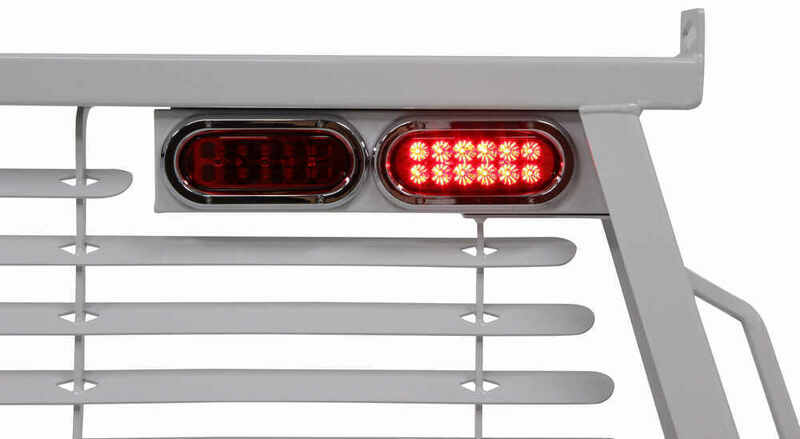 They told me that the third brake light on the back of your truck cab would not be blocked when the Headache Rack, part # BWPUCP7500WA is installed. 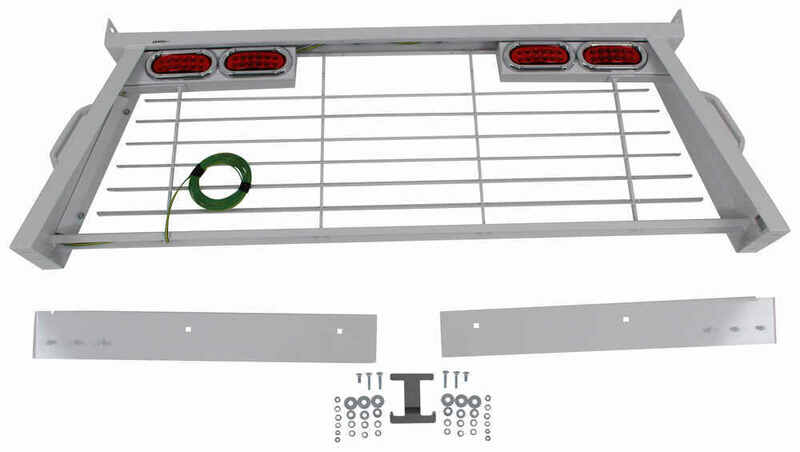 I have attached a photo of the headache rack and have noted the area B&W said the brake light would be in when the rack is installed. 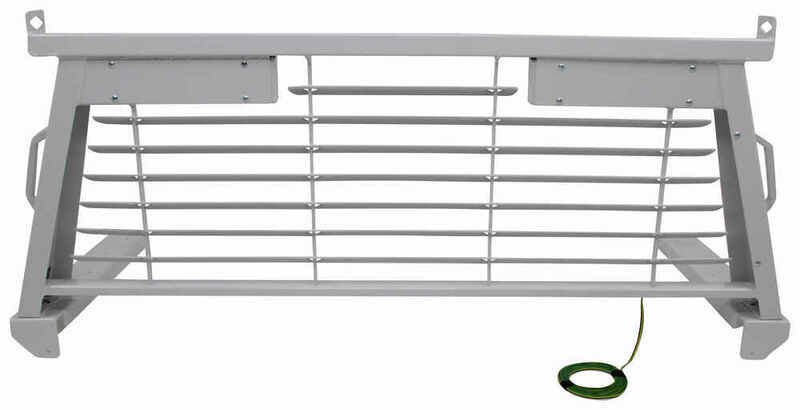 It is right between the small louver and the top bar of the headache rack. I spoke with my contact and B&W and the Custom Headache Rack # BWPUCP7500WA is made of 10 gauge steel except for the flat plates that attach to the bed sides. Those are 7 gauge. This rack is not tested with toolboxes or tonneau covers so it is difficult to determine if it will work in conjunction with those items. It likely will not work if the tonneau cover blocks the lip in the inner part of the bed sides. 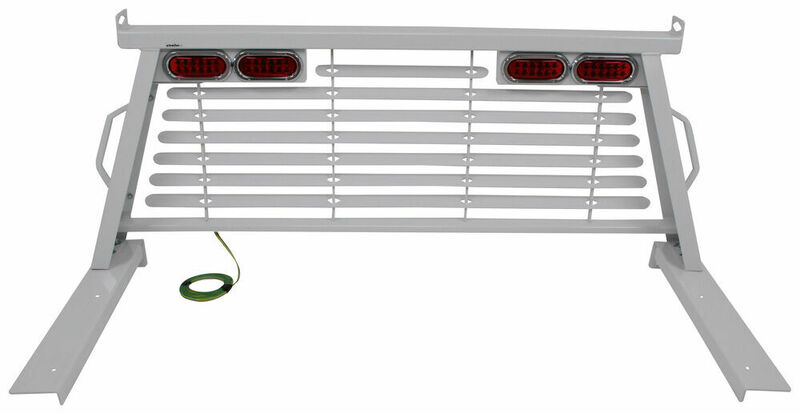 Yes, the B&W headache rack is available in white for your Ford Super Duty. It is # BWPUCP7500WA. It and the black version have the same cost. Current pricing is available on each product page. Highest quality headache rack for the best price. Most detailed, accurate headache rack information available.